With respect to the other reviewer, this glove is not advertised as waterproof on Carhartt's site or in the glove packaging materials. 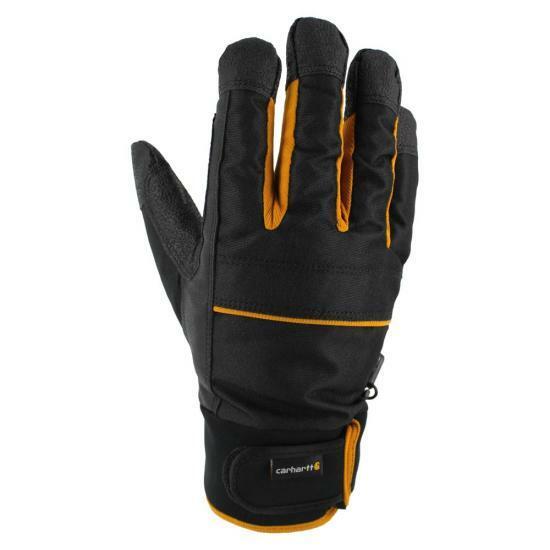 I've found it water resistant, however, and better than a leather insulated glove in damp conditions. It also dries faster. It is warm, lightweight, comfortable, and seems pretty durable, though I only began to wear it and the weather got warmer so I probably won't wear 'em again until next winter. Not a bad glove at all and reasonably priced. not waterproof. I'm a railroad worker in the northeast and my hands are in the snow a lot. these gloves get wet. Looking forward to trying these gloves in less severe winter weather! They are a bit tight. But may stretch out enough. With size 2X hands it is difficult to find gloves comfortable and roomy enough for these big meat hooks!